The reason for that was that there was a lack of acceptance that the sales process had changed in the internet, mobile, social media age. Issue 1. - If somebody made an inbound call of the company it was expected that this person would be C-Level otherwise the lead would be ignored. I'm not aware of any C-Level person who rings up suppliers, they will get somebody to do it, the intern for example. That intern, may not know all the details. Just because an intern calls you up does not mean there is no deal. Issue 2. - There is an assumption that a company must be fully BANT for it to be a deal. Sales people ask for fully BANT deals, this is strange as most fully BANT deals will be locked and loaded for other suppliers. Salespeople need to remember that it is their job to get build the business case (budget) and often to create the desire for a quicker timescale. Issue 3. - Building relationships have always been critical as part of the sales process. People buy from people and people buy from people they know and trust. Assuming the SDR has created the relationships in the first place and connected to the people on social. Salespeople may find that the SDR own the relationship. I must admit that as a new business salesperson I did the SDR job myself, still don't understand why you would want to abdicate your quota to somebody else. But what do I know? Get the entire sales team working together to define “sales qualified” – and then live by that definition. 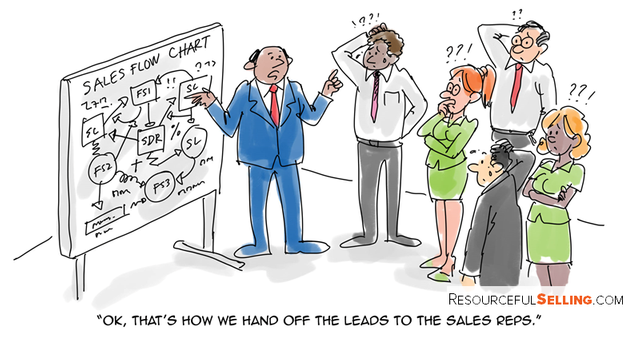 Then sales development reps can only move a lead the moment all the agreed-upon criteria is met. Sales development reps also commonly use questions based on one of these frameworks: – BANT (Budget, Authority, Need, Timeline) – ANUM (Authority, Need, Urgency, Money), or – GPCT (Goals, Plans, Challenges, Timelines).